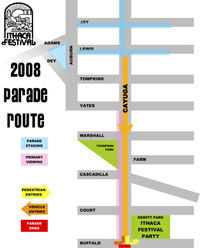 The Ithaca Festival is a 30-year festival of music and art celebrating the creative spirit in all of us. We have just expanded our Festival "footprint" to include Stewart Park and the Farmers' Market on Friday, Saturday and Sunday! 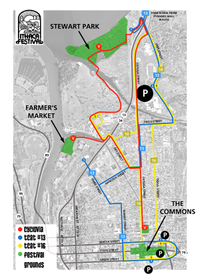 Please take a look at our circulation map that shows you how to get around via TCAT and our Cyclovia Bike/Pedestrian Pathway! Enjoy more of Ithaca! Please view our Commons and Stewart Park maps.